Mar 1, 2014; Stillwater, OK, USA; Oklahoma State Cowboys guard Marcus Smart (33) dribbles up court during the first half against the Oklahoma State Cowboys at Gallagher-Iba Arena. 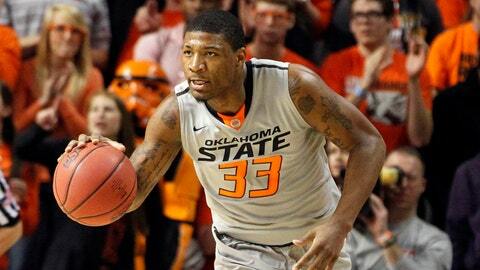 STILLWATER, Okla. (AP) — Marcus Smart had no intention of avoiding Joel Embiid, Kansas’ 7-foot shot blocker. Even after a first half in which he missed all seven shots, Oklahoma State’s star guard remained intent on challenging one of the nation’s most intimidating post players. Smart’s strategy worked. He scored 20 of his 21 points in the second half to help the Cowboys defeat the fifth-ranked Jayhawks 72-65 on Saturday night and give a major boost to his team’s once-fading NCAA tournament hopes. Smart made five of seven field goals and eight of 12 free throws in the second half. Embiid committed three fouls in the first 6 minutes of the second half, twice sending Smart to the free throw line. From there, the tone was set. "I was always taught that you’ve got to attack the shot blocker," Smart said. "You’ve got to attack his body and chop him down a little bit. Take his legs from under him and that makes him a little shorter." Oklahoma State coach Travis Ford knew Smart was capable of turning things around. "After the game, I told him he’s a piece of work," Ford said. "You have to stick with him, because he’s going to make plays. He’s a competitor. That’s what he did. He was huge down the stretch." Markel Brown scored 21 points and Le’Bryan Nash added 16 for Oklahoma State (19-10, 7-9 Big 12), which overcame a 10-point deficit in the second half. The Cowboys improved to 3-0 since Smart returned from a three-game suspension for shoving a Texas Tech fan. Andrew Wiggins scored 15 points, Embiid had 13 points and 13 rebounds, and Wayne Selden added 13 points for Kansas (22-7, 13-3), which already had clinched the Big 12 title outright before tipoff because Texas and Iowa State lost earlier. Kansas coach Bill Self didn’t care about the regular-season championship after the game. He was more focused on his team’s 22 turnovers and 23 personal fouls. "To me, we missed our opportunity to celebrate," he said. Self was concerned with how his team fell apart late, especially defensively. Oklahoma State shot 64 percent from the field in the second half. "What’s frustrating to me is we had the game where we wanted it and then we didn’t make competitive plays down the stretch to give us the best chance to win," he said. The Oklahoma State student section was filled nearly an hour before the opening tip. The crowd included Oklahoma City Thunder players Kevin Durant and Russell Westbrook and their coach, Scott Brooks. Wiggins’ three-point play tied the game at 64 with just over 2 minutes to play. Kamari Murphy’s layup gave Oklahoma State a 66-64 lead with 1:37 remaining. Kansas’ Naadir Tharpe missed a jumper, and Murphy pulled in the rebound. Smart made a layup with 46.1 seconds left to push Oklahoma State’s lead to four, then he broke the press and hit another layup with 23.8 seconds to go to put the game out of reach. The Jayhawks led 26-25 at halftime despite 35 percent shooting. Brown hit a 3-pointer in the opening seconds of the second half to give Oklahoma State a 28-26 lead, but Kansas answered with a 3-pointer by Selden. Smart made his first field goal, a 3-pointer, with 17:46 to play. He drew the third foul on Embiid with 14:19 to go and the Jayhawks up 38-36. Wiggins picked up his third foul 11 seconds later. Kansas responded with a run. With both freshman stars on the bench, Tharpe and Selden drained 3-pointers that helped put the Jayhawks up 46-38. A three-point play by Perry Ellis pushed Kansas’ lead to nine, and a pair of free throws by Wiggins extended the margin to 10 for the first time. Oklahoma State muscled its way back into the game with a three-point play by Nash and a long lob by Smart to Brown that cut Kansas’ lead to five and got the crowd back into the game. The Cowboys moved into the double bonus with 5:50 remaining, and Brown made two free throws to give Oklahoma State a 60-59 lead. The foul situation was a worst-case scenario for Kansas, given Smart’s ability to attack. "Of course, when you’re the best guy in America at drawing fouls, you’re going to be driving every time," Self said. Smart’s 3-pointer with 3:44 left put the Cowboys up 63-61. Oklahoma State then closed the game out, something the Cowboys struggled to do during their seven-game losing streak. "That’s what we’re capable of doing every night," Brown said. "We were just poised out there on the court tonight, and we took advantage of the mistakes that Kansas made."